The Daking Mic-Pre IV offers four channels of high performance, Class A preamplifiers in a single rack space unit with outboard power supply. Configured for four microphone inputs or four line inputs from XLR/TRS Neutrik combo jacks on the back, plus four line inputs (+10 to -50) or 1/4 hi-z instrument inputs on the front, the Mic-Pre IV utilizes all discrete Class A circuitry with transformer-balanced inputs and outputs. The new Mic-Pre IV from Geoffrey Daking & Co. is the latest example of exemplary audio quality and craftsmanship in the tradition of the great British console manufacturers. 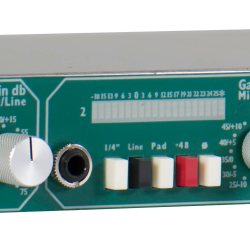 The Daking Mic-Pre IV is a highly cost-effective solution for high-end preamps to be used in studio or live applications. Used standalone or in conjunction with a console, each input offers a stepped (5db) gain control using Daking’s signature aluminum knobs, a 20-segment LED level meter with +24db peak indicator, switchable mic/line or hi-z instrument, switchable +48V phantom power, switchable input phase and switchable 20dB pad. 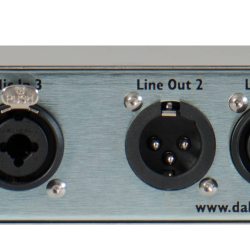 The Daking Mic-Pre IV is housed in a robust all stainless steel enclosure with an outboard DC power supply in a separate housing, offering not only durability but immunity from noise and RF interference. The attention to detail extends to the internal components, which include gold bifurcated contacts on all relay switching. The supplied universal power supply can operate at any voltage for use worldwide.